Although still in its infancy, anytime anywhere mobile learning is shifting traditional teaching and learning process and leading to new pedagogy. But mobile learning is more than just using a mobile device to access content and communicate with others – it is the processes of coming to know through exploration and conversation across multiple contexts amongst people and interactive technologies. Scenarios are a great way to make mobile learning more engaging. In this post, we will walk you through different aspects of scenario-based Learning (SBL) to help you design effective mobile learning courses that motive and engage learners. What is SBL and Why? 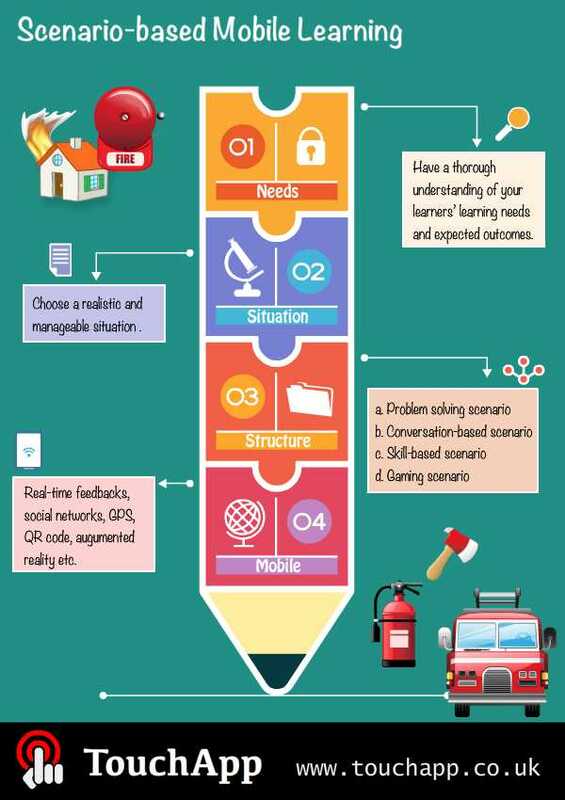 Scenario-based Learning immerses learners in situational simulations or learning experiences through virtual environment that allow users to gather professional skills and experience for future use. Instead of just passively taking in provided content, learners have the chance to participate in real-life situations, turn information into practical application and learn to solve real world problems. SBL challenge learners through particular tasks and learners gain core knowledge and skills by successfully overcome them. Learners can directly see the benefits of SBL courses thus improve their engagement with the content. Scenarios provide learners the opportunity to identify, analyse and formulate strategies to solve real world problems. By completing structured learning activities, learners relate knowledge with practical applications. Virtual scenarios allow users to gain hands-on training without having to face the consequences or bear the costs of a wrong decision. How to design Scenario-based Mobile Learning? Unlike traditional learning settings, in a mobile learning environment, learners interact with multiple contexts through mobile devices. Here are some elements to keep in mind when designing scenario-based mobile learning. Identifying your target audience is the first step to build any mobile learning course. You need to have a thorough understanding of your learners’ learning needs and expected outcomes to create relevant, engaging, and effective scenarios. For example, what kind of problems do your learners face in their working environment? What are the main professional skills they expect to develop? What kind of situations the learners will face to apply the trained skills? What are their learning goals and aspirations? It is impracticable to turn every working situation into a scenario, and not every setting leads to instructional context. So it is essential to prioritize critical situations to turn them into meaningful scenarios. It is important to build realistic and informative scenarios, but to avoid information overload. For example, you can choose situations that arise frequently at the workplace, thus provide opportunities for learners to exercise good practices of those situations. Although SBL strategy has been widely used in education, you can apply some mobile specific features to increase the efficiency of learning scenarios. For instance, through cloud technology mobile devices can collect and analyse learners’ performance within a scenario, thus it is possible to integrate function models in SBL to provide real-time feedbacks. Today’s mobile learners are naturally connected through social networks such as Facebook, Twitter etc. You can encourage learners to learn/work together in certain scenarios over the Internet, and this collaborative learning style will help develop learners’ skills as team players, which they eventually carry over into their working life. Mobile device also provide ways to connect virtual content with physical environment, which can be a unique element for scenario-based mobile learning. For example, GPS information provided by devices can be used to trigger location-related scenarios to address immediate problems, real calculations and merge practical learning together with theoretical experiences. Recently, augmented reality (AR) technology has created great waves in the mobile learning field. AR merges the digital information with the viewer’s physical surroundings. Scenarios are no longer limit to virtual world, but extend to the real environment around you. One famous example of this is the Star Walk mobile app. This app allows you to explore the extensive information about stars, planets, satellites, and constellations by holding your phone at the night sky.